What is behind door #1? Though it may be hard to spot, there was a lot of layout rework to make this a functional space for the family. A corner pantry replaces the entrance from the garage, which was always a pinch point. Relocating the door from the garage gave us room to create an actual mudroom for this family of four. A new corner pantry replaces a formerly awkward garage door that created a horrible pinch point and left shoes piled up in the corner of the kitchen. Left: Relocating the garage door and co-opting some closet space allowed us to create this mudroom space. Above: Additional storage in this extra deep island ensures everything has a home. Above: A formerly walled off room is now an integrated space thanks to a little demo. Now no cook need be lonely in this kitchen. While the bathroom was functional, it was certainly lacking any personality and the homeowners were over the water streaks below the hand towel. We brought in the wainscoting and wallpaper as wipe-able surfaces that would better hold up to the water streaks. We converted the pedestal sink to a 36″ vanity with storage and whole lot more wow with its marble top. Add a new light fixture and custom window treatment and you have a gorgeous new powder room. Dated was the least of this kitchen's crimes. Underlit, poorly laid out, a mobile dishwasher that was loud and ineffective, and an awkward closet that backed up to the stairs also made the list. But with a little ingenuity, a better layout, and some beautiful finishes we transformed the space into this family's dream space without breaking the bank. Left: A pullout cabinetry (with trash receptacle inside) becomes a mobile island with tons of flexible function. Above: A bench tucked in a well lit corner at the end of the kitchen becomes not only a favorite spot to work or keep the cook company, but also a neat spot to tuck away shoes to combat the cramped rear entry. Above: Familiar with those awkward, chopped up closets over the stairs that don't go all the way to the floor? That is a distant memory in this kitchen, because now the space houses a butler's pantry for bulky appliances and extra kitchen storage. With doors that swing all the way open, this space becomes an extension of the kitchen vs. an awkward closet. While on the surface this kitchen wasn’t in desperate need of a remodel, odd appliance placement and an awkward island shape that didn’t work for this family, were high on the list to be reworked. When built-in appliances stopped working and needed to be replaced, thoughts on a partial kitchen rework sparked conversation about what could be gained by more drastically updating the space. Enter a newly laid out kitchen with better function, flow and of course form. Above: The backsplash in this kitchen is tonal and understated but oh so pretty. The delicate crackle and hand glazing adds such richness. Above: A new wall to wall built-in in the dining room completed a space that felt unfinished and added function along side form. Above: The mudroom off the kitchen was in need of added function as well. New cubbies provide a place for everything, so everything can be in its place. Pull out drying racks and a counter for folding, makes sure this multifunction room can handle double duty. The kitchen was dated, cramped and the dual doorways made for an awkward layout. The dividing wall also cut the kitchen off from the living room, leaving both spaces small and isolated. The most drastic change came in creating one large opening to combine the two rooms. Removing the bank of uppers across the peninsula, adding custom two-tone cabinetry and new flooring throughout to unify the two spaces, made a world of difference. The homeowner wanted to feel like she was living in Tuscany so distressed cabinets, tumbled backspalsh tile, faux beams, and wrought iron light fixtures and hardware create character in a space that was lacking it before. Now the main level is united for family living and this homeowner can sip a glass of wine in her very own Tuscan paradise. 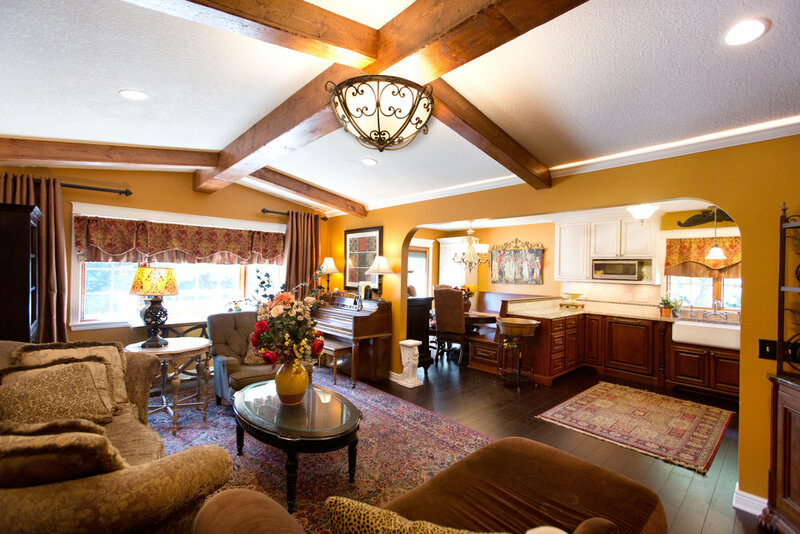 The driving factor in this remodel was recapturing the seldom used formal living room and creating a larger, open concept floorplan. By removing the non-bearing wall, we doubled the space which afforded us a much larger area to create the kitchen. A new island and adjacent sitting area creates ample room for entertaining. Above Left: Bringing in a similar stone to the existing fireplace created unity throughout the house but also a fun, textural element to the island. Above Right: Distressed alder cabinets contribute to a slightly rustic feel.